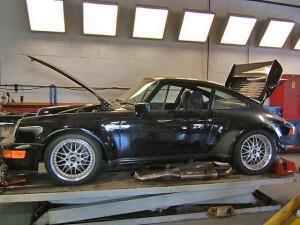 Perfect mechanically and needs minor interior detailing-such as a new headliner and dash. Extensive history of this vehicle. 3.4, cams B&B exhaust, Hydrid Custom Single Turbo with Andial Intercooler, 5 speed G5050 transmission, RSR suspension, Modified 13″brakes. Fiberglass wing. Fieranno built 500HP, Sammon 17″ Rims 1990C2 Bumpers. Holds lap record at Mossport. Consistently beats Twin Turbos. Fully servicedby Keltech.